Earlier this week we began looking at our final production for the 2012/13 season, which features a double-bill of Poulenc's La voix humaine and Puccini's Suor Angelica. Nuccia Focile stars in the first of those two Seattle Opera premieres, and we chatted with her on Monday about the role. Today, we switch focus to soprano Maria Gavrilova, who makes her company debut as Sister Angelica, a noblewoman-turned-nun. Puccini's one-act opera takes place seven years into Angelica's stay at the convent, which she entered after giving birth out of wedlock. 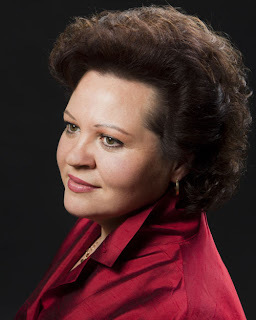 Below, we speak with Gavrilova about "Senza mamma," the aria Angelica sings upon learning the news of her son's death. Why does your character sing the aria “Senza mamma”? She is reacting to the news that the child she did not know has died without knowing her great love for him. Does your character change as a result of singing this aria? Angelica starts the aria with the sadness for both the child and herself, that they never knew each others love. At first she is sad (the aria begins in A Minor), imagining him dying alone and sad. She then thinks that he is happy in heaven (changing to F Major), and thinks how happy she will be when they are together again. “Senza mamma” is such an affecting piece. Do you have to keep a lid on your own emotions so they don’t interfere with the physical work you have to do to sing? I have to do this in many roles, not only Suor Angelica. Is it very different singing Puccini’s sopranos who are mothers—Butterfly, Suor Angelica—from the ones who aren’t (Manon Lescaut, Mimì)? There is much less tenderness in the roles of Tosca, Manon Lescaut and Minnie than in the suffering mothers Butterfly and Angelica. Mimì is tender, but La bohème is a story of young love. What do you like most about singing this aria? Its combination of sweetness and power. What’s most challenging about it? For me the most challenging are the pianissimi high notes in the aria, and even more so at the end in the prayer after the aria. After “Senza mamma,” you’re still the only one onstage. How is the rest of the opera different from the part that’s technically considered the aria? After the aria is when Suor Angelica loses her rational mind and is in ecstasy thinking about her son and herself in heaven. This music, not only the singing, but the orchestra too, is what we think of as real Puccini. Do you remember the first time you heard this aria? Where were you? Who sang it? What do you remember thinking and/or feeling? Yes, I heard Mirella Freni sing it on an EMI aria recording from the 1960s, when I was a student at Moscow Conservatory. The recording I like the best was a video from La Scala of Rosalind Plowright. Both singers impressed me by how they used their voice in such a difficult aria with feeling. Below, a video of Rosalind Plowright, singing "Senza mamma" at La Scala in 1983. Coincidentally, Plowright (who made her Seattle Opera debut in 2008 as Klytämnestra in Elektra) will sing the role of The Princess, Angelica's cruel aunt, in Suor Angelica next season!